We hit an incredible company milestone last month surpassing 1 million downloads of our free communication and therapy apps. This is an amazing feat, and we would like to thank all of you! Whether you're a professional using our apps with a client or someone hoping to improve his or her communication skills — it's your continued use of our apps and your willingness to share them that led to 1 million downloads...and counting! We are beyond excited to see the Lingraphica apps — now 18 strong — so well received by all of you. Lingraphica's mission is to help anyone with a communication, language, or cognitive disorder find the tools to guide them on their journey. This is why we develop FREE apps, in addition to our communication devices, all of which are reimburseable by Medicare and most commercial insurance carriers. Regardless of anyone's financial situation, we believe everyone should have access to tools that can help. If you have a speech, language, or cognitive deficit, or if you’re the parent or caregiver of an individual with a deficit, we will help you find an effective solution to help you communicate. If you are a professional or SLP working with speech therapy clients, we're here to provide clinical, technical, and educational support with our apps and devices to make your job easier. We mean it when we say we're "Your Partner for the Journey." 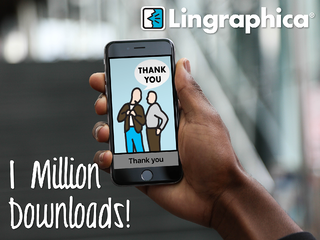 To show everyone our gratitude for helping us reach the 1 million download milestone, we've created "The Guide to Lingraphica's Free Apps." If you'd like to receive "The Guide to Lingraphica's Free Apps," simply click the button below. Enjoy!